Following Thursdays UK interest rate cut to 5% from 5.25%, which followed unprecedented action by the Bank of England in providing £15 billion in liquidity to the UK banking system in recent weeks. 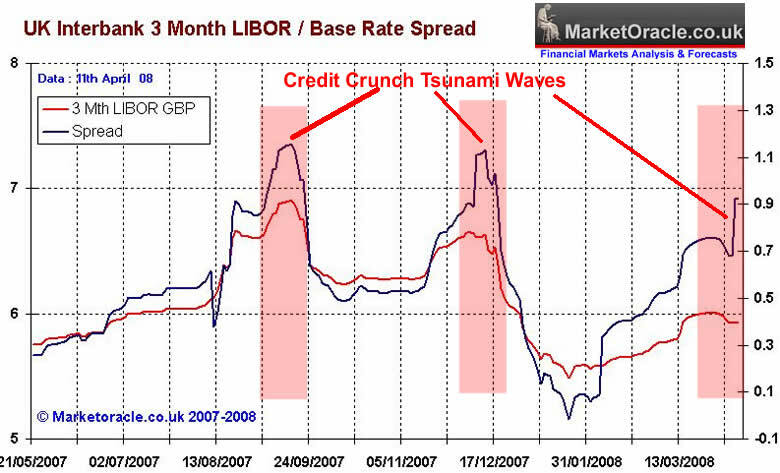 So far the interbank market has failed to respond to these actions, which saw the 3 Month Libor rate / base rate spread expand to recent credit crunch extremes as illustrated by the below graph. This means that the banks are extremely reluctant to pass on Thursdays rate cut to customers. Some of the tactics deployed by banks to confuse customers, is to raise interest rates before the interest rate decision and then cut by the same amount following the rate cut, thus no net change. However the continuing credit crisis has eroded banks balance sheets to such an extent that some banks even went so far as raising interest rates on some mortgage products following the rate cut. "The announcement by the Bank of England this week that it is cutting interest rates will reduce pressure, and I hope banks and building societies will pass that on. What I am saying to the banks is we have helped them... therefore it is time to ensure that the banks themselves help both individual businesses and mortgage holders by ensuring they pass on these interest rate reductions." Clearly the banks deepening aversion to risk and lending is in advance of much worse to come as the UK housing market showed clear signs in recent statistics of embarking upon a bear market to rival that of the early 1990's. The banks actions are signaling preparations in advance of a UK recession, when the number of bad debts is expected to surge which will hit the already weakened banking sector hard. Therefore the banks are only likely to respond to fundamental changes rather than short-term Bank of England fixes. These fundamental changes take the form of stabalising US and UK Housing markets, and an economy that is expanding at trend growth rather than slowing towards GDP contraction. Neither of these conditions is likely to occur for the next 18 months or so.